It’s not very often that an artist can renew the sounds of our roots and bring them to an audience in an entirely new light. Mr. Justin Townes Earle is the soundtrack that your grandparents, your parents and now even you would set to frame your day to day life around. He sings those songs about your grandma’s porch in the hot Southern summers where the dog is sitting by your feet and the old man is playing his banjo. 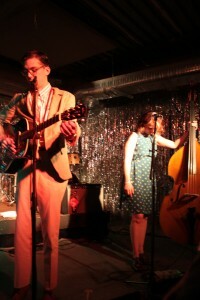 Mr. Earle played the Marquee Room on June 23 for Sled Island following the fantastic opening act The Donkeys. Earle, who could be called our generation’s Woody Guthrie, sang about everything from his “Mama’s Eyes” to absolving his sins in the river. Earle opened with his band-mate Brenda on double bass and had the crowd jiving from the beginning of his show right until the very end, which saw an eruption of applause nearing uproar of encore shouts. Unfortunately Earle had an early plane to catch in the morning, so he was unable to encore, he argued he was a guy who needed his sleep. There is a degree of egoism at times with some artists when they get up on stage. With Earle, however, there was a total sense of equality and comfort. He was just one of the guys who liked to play his music, smoke a few joints and who got pissed off at the border controls. Dressed in ‘50s Buddy Holly garb, including some vintage lace up shoes Earle spun out his hits “Harlem River Blues” and “Slippin’ and Slidin’”. Earle confessed to the crowd the latter was about his battle with cocaine. His version of “Slippin’” lacked drums and a saxophone. Stripped down to his acoustic, Earle’s melodies became a lot more intimate, personal and impassioned. He filled the Marquee for an hour with his down to earth bluegrass inspired country folk, he brought to mind many of the original American guitar troubadours who defined the folk and country tradition like Pete Seeger and Hank Williams Sr. Earle’s sense of humour kept his small audience laughing as he introduced his song “Move Over Mama” with a story about leaving town and finding your girl sleeping in the middle of the bed when you get home. Earle managed to play a variety of songs from each of his albums. His foot-stomping guitar pieces were brought to a beautiful denouement with an emotional rendition of “Someday I’ll be forgiven for this”. Throughout his performance Earle’s passion for his craft shined through as he was frequently closing his eyes to immerse himself in the music and his audience followed by slowly swaying or dancing. Though country has taken a major turn in the past few years it seems that no other artist has taken the roots of American folk and blended it so well to fit into a contemporary setting.